Thanks to BHPian RavenAvi for sharing this image with other enthusiasts! 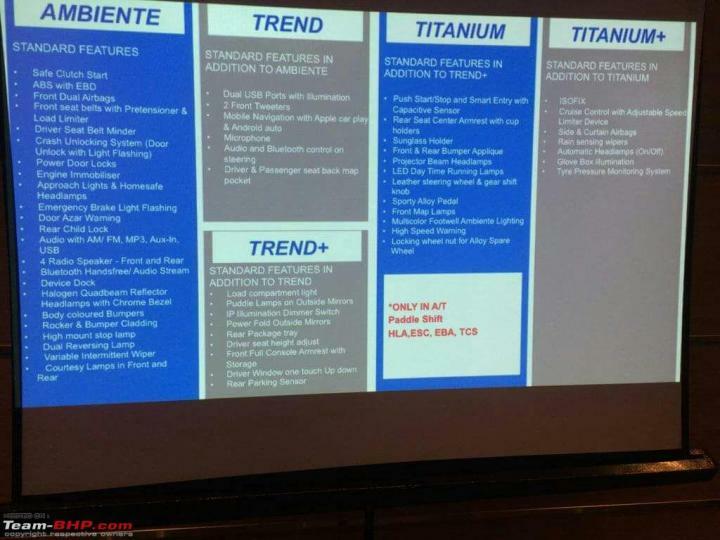 Ford is expected to launch the EcoSport facelift in India soon. 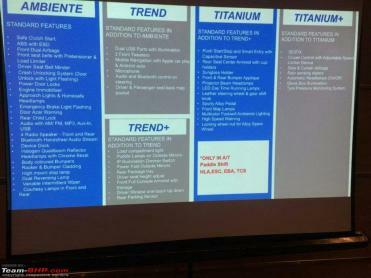 According to the shared image, the facelift will be available in 5 variants - Ambiente, Trend, Trend+, Titanium and Titanium+. Safety features like ABS with EBD, front dual airbags, front seat belt with pretensioner and load limiter, crash unlocking system, power door locks and emergency brake light flashing feature will be standard across the range. A 4-speaker audio system with Bluetooth, AM/FM, MP3, USB and Aux-in will also be available on all variants. The base Ambiente variant gets halogen headlamps with approach lights and courtesy lamps in the front and rear. The Trend variant gets illuminated dual USB ports, steering mounted audio and Bluetooth controls, mobile navigation with Apple CarPlay and Android Auto as well as 2 front tweeters in addition to the 4 speakers. The Trend+ variant gets additional features like power folding ORVMs with integrated puddle lamps, height adjustable driver's seat, front console armrest with storage, rear parking sensors, etc. The Titanium variant gets projector headlamps with LED DRLs, keyless entry with engine start/stop button, rear center armrest with cup holders, leather wrapped steering wheel and gear lever, high speed warning and aluminium pedals among others. In addition to the aforementioned features, the Titanium+ variant comes with cruise control with adjustable speed limiter, rain-sensing wipers, automatic headlamps, side and curtain airbags, ISOFIX child seat mounting points and tyre pressure monitoring system. The Ford EcoSport facelift will be offered with a choice of petrol and diesel engines. While the specifications of the diesel are not yet known, Ford has already announced the new 1.5-litre, 3-cylinder Dragon Series petrol engine. It produces 121 BHP and 150 Nm of peak torque. A 5-speed manual gearbox will be standard, while the automatic variant will come with paddle shifters, ESC, traction control electronic brake assist and hill launch assist.